Here is my training recap for the last week. Tuesday: Run 35 minutes - my "run" is still very rough. My cardio is in serious need of improvement. OK, so Friday was supposed to be a run day but I didn't wake up early and then work got crazy and I had to meet people out that night to see the band Live so it was sacrificed. All I hear in my head when I don't workout in the morning is a quote I saw on Sweaty Emily's page that said "I never regret a morning workout but I regret every morning I don’t workout." I head my head in shame now. This is a new week and today is a rest day which for the first time has made me feel antsy. I have a lot of mile to catch up on for #500MIJ and I wanted to do something but I am sticking to the plan and following the rest days. One last thing, I am in need of donations for the LIVESTRONG Davis event on July 10th. Anything you can give will be greatly appreciated and goes to a good cause. Plus it allows me to ride a 70 mile cycling event with Team Fatty! Thanks for your help. I am feeling pretty good these days. I have gotten myself back on track with my training finally. A little late for my last race but no worries, I am right on time for upcoming races. I did the Tri Latta Sprint Triathlon on Saturday which was a great event. I really enjoyed the course and will be making a point to do it again next year. I was thankful that the run course was on trails through the woods so it was nice a shady which was excellent since it had started to warm up. I had a lot of fun. Sunday I meet up with a friend so that we could do the 100 Miles of Nowhere ride that Fatty puts on every year. We had never actually ridden 100 miles so it was a good opportunity to see what it was all about and if we could even do it. The goal is obviously to ride 100 miles in one day but the trick is to find a short loop to do it on or to ride it on a trainer. Basically you should feel like you are going nowhere for a very very very long time. We started out at 10am (I realized later that we should have started much earlier) and rode the 1.5 mile loop. We took a break at 25 miles to refill water bottles and visit the nutrition table. What? I like to have options. We went back at it and as the heat started to kick in. While circling the same loop is a little boring after awhile, it allowed me to figure out the best way to ride certain spots on the loop. It was a great learning experience for sure. My riding partner was fading fast so we stopped for lunch at mile 45. It was starting to get pretty hot so I setup my trainer in his basement to knock out five miles I had left to reach 50 miles. It would have really bugged me to stop before I finished the 50 miles. The lunch break was MUCH longer than I had planned for it to be but it helped to get my riding partner rested up and back on the bike. We changed the loop from a 1.5 mile loop to a 1.3 mile loop. The 1.3 mile loop was nice because it was something new to see for the second 50 miles. The riding partner made it about 15 miles and then was cooked. He dropped and went back to the house. The one good thing was I could now just zone out and start pedaling away. I rode to 81 miles and then stopped to refill my water bottles. It was about 91 degrees out but I was feeling pretty good. As I started off to finish my last 19 miles the threat of storms finally made good and it started to rain. It actually felt pretty good and it cooled everything. I was counting down laps as I went and making up little rhymes to go along with it. #5 is alive! 4 then the door. 3 then I am free. 2 then I am through. 1 and DONE! The last 3 laps were really taking it out of me but half way through that last lap I was on FIRE! 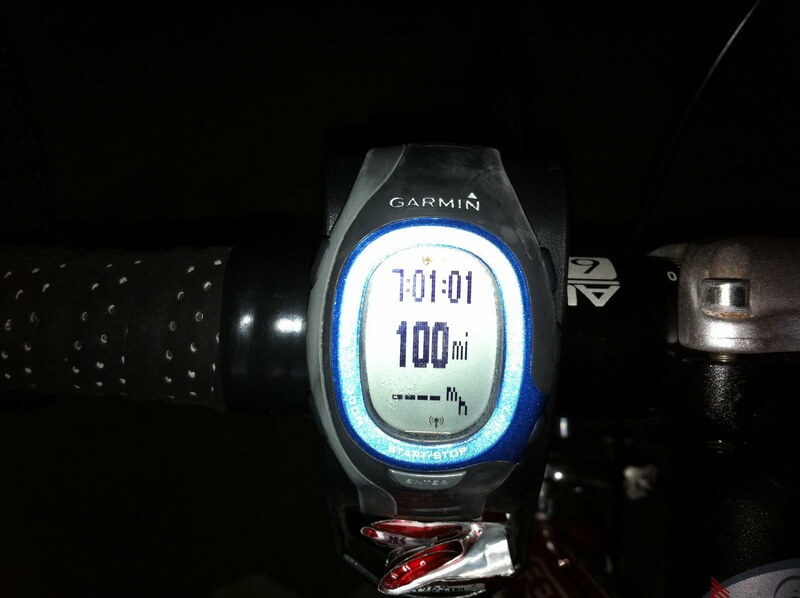 When my garmin showed 100 miles I was so pumped! Nothing hurt, I just felt amazing! !